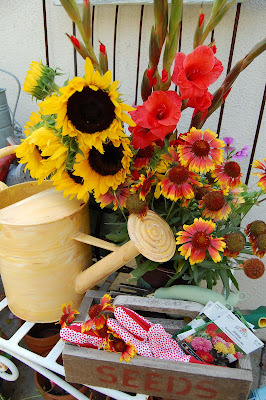 My Painted Garden: Exciting News to Share! For me part of the joy of receiving good news is sharing the news with my wonderful new friends in Blog Land. 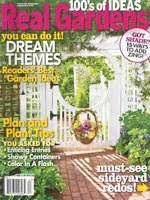 So here goes - my garden and art will be in The March issue of Country Sampler Home Tours edition. 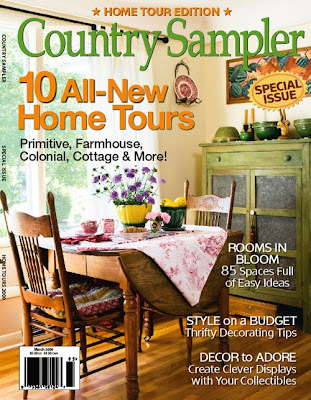 Franscoise O'Neill ( Fabulous Fifi) and Sunday Hendrickson (devine art director) scouted my home and garden in August 2007 and a year later Sunday called me with the exciting news that the Home Tour Issue of Country Sampler wanted to shoot my garden. Needless to say, I was excited beyond words. 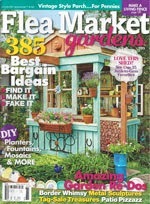 Sunday and fabulous photographer Mark Lohman arrived at my home in August 2008 at 6:00 AM to shoot my garden. When I met Sunday and Fifi I thought "blogs" were something that only Politicians and Newspaper writers used to promote themselves. LOL - I visited Fifi's fabulous blog, http://fabulousfifi.typepad.com/ and was immediately hooked on the world of blogging. Fast forward a year and a half later and I am sharing my joy and excitement with you on my own blog. Now for the fun part. . .Elizabeth Preston, Associated Editor of country Sampler Magazine, asked me if I would be interested in donating a painting which the magazine would give a way to their readers. Of course I said yes and donated one of the paintings that was photographed for the magazine. I do not have all of the details yet as to how the give a way works, but will let you know as soon I have more information. 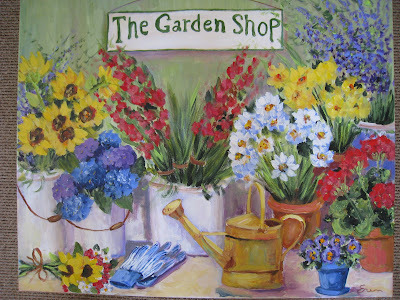 The painting is the one of "The Garden Shop" which I use on my blog banner. Yes, Bentley will be in the magazine article - Sunday was able to get him to "pose" for only one shot as most of the day he spent running around in and among the cameras and camera cords. Erin, many congratulations to you...this is wonderful news, I'm so very happy for you. I really look forward to reading the article. 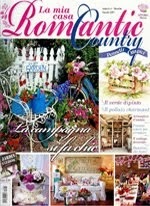 I hope it brings you many sales and much deserved recongnition. Oh my word!! Your blog looks fabulous!! I adore everything here and I lOVE the header! so pretty! You do such beautiful work!! and Congrats on your article! 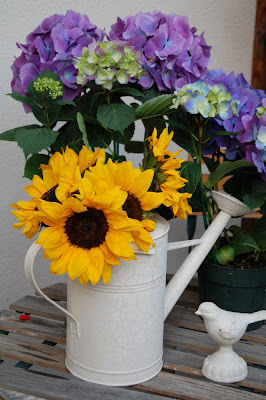 I have loved seeing all these Spring colors and blooms! Simply Stunning!! How very exciting! That is wonderful news. I can't wait to see the article. Don't you just love Fifi? 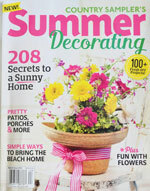 Congrats Erin on your wonderful article and kudos to Fifi and Sunday too. How exciting! I'm so happy AND proud of you! 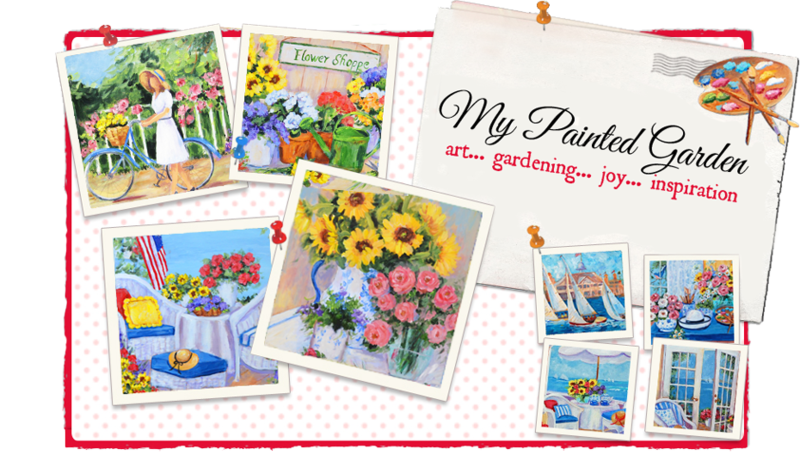 I love your art...so bright and cheerful and happy! I'm so glad you shared your good news with all of your friends! Erin, that's wonderful!! I'm so very excited for you. Congratulations my friend! I'll definitely be on the look out for the magazine. 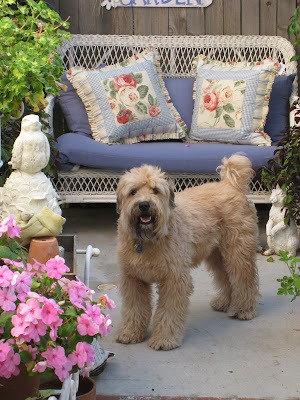 I have something for you at my blog - if you get a chance later, be sure to stop by! Congratulations! 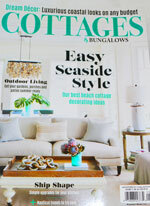 How exciting to be in such a beautiful publication:>) I just yesterday saw it on the newstand and now I have to run out and get it to look for youre article! 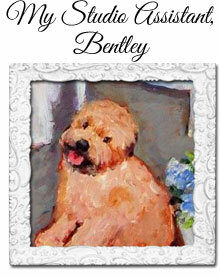 OOOHHH Crumpet is sooo jealous of Bentley now that he is going to be a big magazine star! How exciting for you! I can't even imagine how much fun that would be to have your hard work featured in a magazine...but boy how you deserve it! I'm going to have to get that issue when it comes out. Make sure to let us know when it's available! Congrats--your paintings remind me of Barbara Felisky--are you familiar with her stuff?? I just came via Kim at Daisy Cottage. Congratulations on your recent publication! Your art is beautiful, and your blog is just lovely. I'll be back! Bentley is a very handsome assistant.